Whether you are a retail manager, assistant, pharmacy team or perhaps work in the head office, you will be able to demonstrate that you have shown outstanding leadership, innovative thinking and problem solving to deliver outstanding results and connect with customers. in 2017 this award has been updated and is now the Self Care OTC Retail Superstar and Best healthcare or beauty retailer awards. 2017Jocelyn Knight, Tina Chow, Katie Yu, Clair Connor, Lynda German, Arthi Prasad, Rae McGillivray from Life Pharmacy Botany showed, once again, what it takes to be retail superstars, with an astonishing Lancome Gift with Purchase event that exceeded all goals and included customers from the WeChat social networking site. 2016Life Pharmacy Botany owner Clair Connor and Glenys Perry decided they wanted their fragrance counters to be one of the best-performing counters in New Zealand. They knew there was room for growth in the fragrance section and pushed their team to reach target goals over the year. Their target was a 10 % increase in sales, but they secretly wanted to push beyond that. 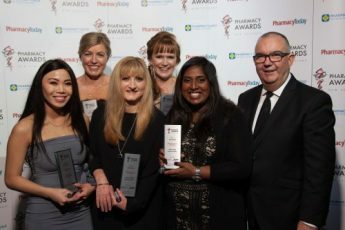 2015The retail team at Life Pharmacy Botany used savvy marketing and advertising techniques to become the number one Lancome account in the country. Jocelyn Knight, Katie Yu, and Clair Connor accomplished the feat by leveraging off their Lancome Gift with Purchase Promotion in May this year, which resulted in a 44% increase in turnover for the annual promotion. 2014Sarah Al-Ani from Unichem Takapuna Pharmacy was faced with the financial ramifications of a major cosmetics counter withdrawing from the store. Sarah surveyed her customers and found strong interest in the Avene range. Using this information, she expanded the small Avene presence in her pharmacy and was able to transform the range into a profitable counter. She more than doubled her stock turnover on the previous year.